When you think of full-size adventure tourers, you usually form an image of a big, burly motorcycle that can intimidate a few people, even before they've taken the bike off the stand. What if I can't handle the weight? What if the bike tips over and I'm unable to pick it up? Will I be able to handle the power? These are the questions that probably crop up in the minds of a few adventure motorcycle enthusiasts, especially the beginners. Middleweight adventure tourers are a lot more accessible in this regard. They are big but not enough to intimidate, quick but not enough to give sportsbikes a serious complex and cheaper to run and maintain. The Suzuki V-Strom 650 XT is the newest entrant in the growing, middleweight adventure tourer segment, and it poses a serious threat to established competition. Inspired by its elder sibling, the V-Strom 1000, the V-Strom 650 XT looks somewhat like a scaled down version of its elder sibling. Looks are subjective, yes, but I'm going to have to say that the V-Strom 650 looks purpose built. Maybe functional is the word. Yes, we'll stick to that. From the large tank, to the beak and minimal rear, the V-Strom 650 XT looks ready to engage in some mud bashing. But the highlight has to be those gold rims. They really complement the canary yellow colour and I think that's the colour you must choose. Unless you find the boring, white shade, and black rims appealing. The wire-spoke rims are shod with tubeless tyres and there are two major advantages of this setup. One is that wire-spoke rims are far more capable of withstanding impacts than alloy wheels and second is that you won't have to hunt for a tube, in case you have a flat. There are bigger adventure motorcycles that sell at almost double the price and still don't offer tubeless tyre compatible rims. Suzuki has managed to strike an ergonomic balance for both on-road and off-road riding. You sit lower (835mm), the pegs are not too rear set and the handlebars are wider. So, long stints on the road are easy, however, the firm seat will take some kilometers to get used to. And when you hit the trails, the shape of the tank helps you hold on to the bike whereas the wide handlebars allow more leverage to manoeuvre around or over obstacles. 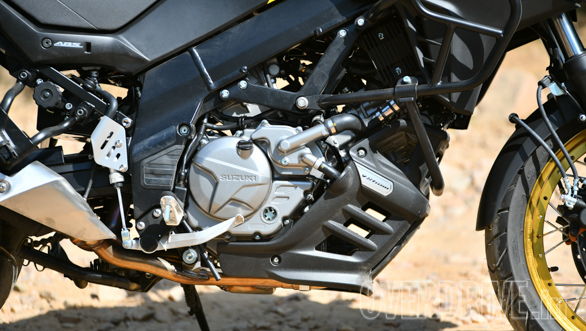 The V-Strom 650 XT employs a twin-cylinder, liquid-cooled engine displacing close to 650cc. The motor is very refined and produces oodles of torque in the low and mid section of the rev range. That makes it relatively stress-free to ride in urban areas as you don't need to keep shifting gears to stay in the power band. 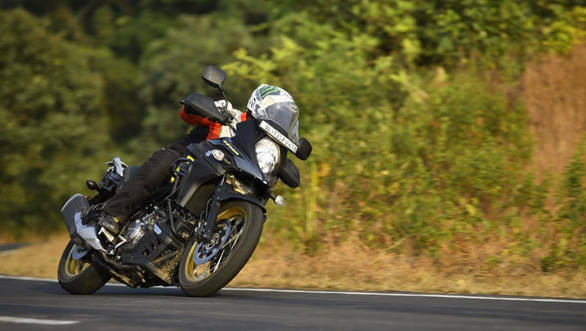 You can pootle around at 40kmph in sixth and it won't cause the engine to protest and in case you want to pull an overtake, a gentle roll on the throttle will see the bike surge forward cleanly. This kind of tractability allows stress-free riding in city traffic. When you begin to push hard, the motor is quick to respond. Power comes in linearly as the bike sprints from 0-100kmph in a 5.08s, which is quick by adventure bike standards. The smooth power delivery is also handy while riding off-road, allowing the rider to feed in precise amount of power. That said, the clever, two-stage traction control system has your back in case you get all ham-fisted. The system alters the level of TC intervention you can turn it off completely, if you've got a hang of stepping the tail out. Besides the motor's tractability, what I really loved is its ability to cruise stress-free. At 100kmph, the rev needle hovers at 4,500rpm only and it'll comfortably cruise between 120-140kmph without any pit stops. This calm nature of the engine translates to great fuel economy as well, with the V-Strom managing 23.5kmpl in the city and 28.2kmpl on the highway. 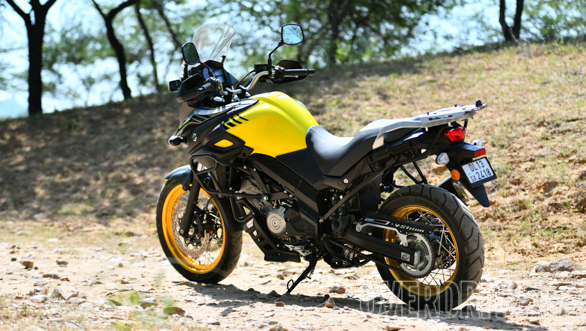 The V-Strom utilises a twin-spar aluminum frame with conventional forks and a preload adjustable monoshock at the rear. Riding over small undulations and bumps, the motorcycle remains poised as the suspension gobbles up imperfections with aplomb. In the corners, it is not an oil tanker either. It's obviously not supersport sharp but it is stable, confidence inspiring and planted through a set of corners. The Bridgestone Battlax Adventure tyres are the dual-purpose type and they offer plenty of feedback, whether on tarmac or off-road. 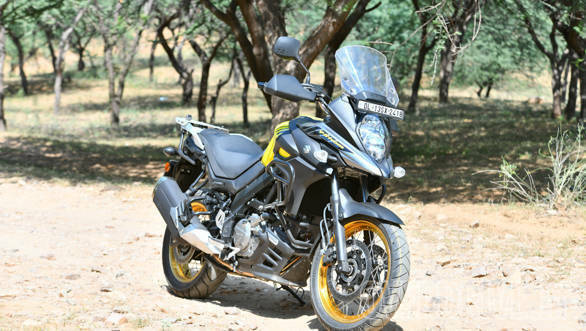 The longer wheelbase, at 1,560mm also contributes to mid-corner stability and on the whole, the V-Strom handles rather well for its size and off-road ability. Besides good on-road dynamics and a relaxed cruising demeanour, the wire-spoke wheels, with tubeless tyres lend the bike serious off-road/ bad road ability as well. The V-Strom 650 is a well built motorcycle that's poised to take on whatever India's roads may throw at it. It feels well built and will take more than a beating on bad roads, without any complaints. The engine is so calm, you can cruise at fairly high speeds without any stress. It is a proper mile muncher. And if you fancy a detour down a dirt trail, the bike is up for it. For a little over Rs 9 lakh on-road, the V-Strom 650 XT is unbeatable value and should figure on a newbie adventure tourers shopping list.